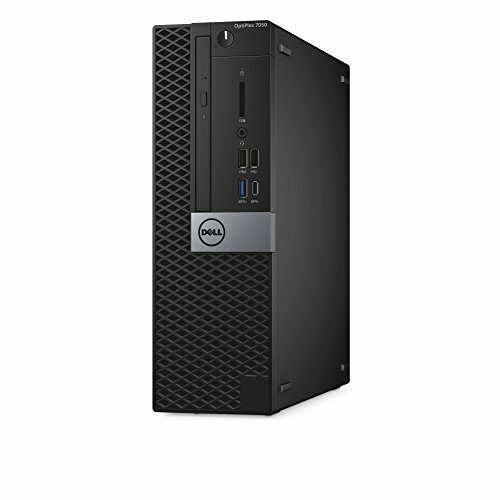 Powerful productivity and expandability Expandable small form factor desktops with business-critical features companies need with the space to add additional peripherals. A conveniently compact, innovative design. Stay flexible: With full-power features in a smart, dual orientation design, the OptiPlex 5050 lets you maximize your work environment. Easy access: With a tool-less design and a simple removable side panel, you have easy access to key system components such as drives and memory so your system can be updated, remaining viable for years to come. Powerful performance. Smart solutions. Power your success: Intel 7th Gen processors make this the fastest OptiPlex yet. Smooth, speedy performance: Upgraded 2400MHz DDR4 is the fastest and most efficient memory available, so you can work with lags or crashes. Connect with ease: Two display ports, native 3 display support, and HDMI with optional VGA, as well as legacy ports provide ample connection to your devices and networks. Trusted reliability. Serious security. Always up to date: Every OptiPlex 5050 is available with Dell Command Suite, making driver, BIOS, and firmware updates easier. These free tools allow flexible and automated BIOS or system configurations for your company, allowing you to manage your fleet easily and securely every time. MINIX NEO Z83-4 + MINIX NEO K2, Intel Cherry Trail Fanless Mini PC Windows 10 (64-bit) & Wireless Keyboard and Touchpad. Sold Directly by MINIX Technology Limited.